I apologize in advance for the lack of pictures. There are no pictures of my trip, I was to tired and frazzled to take pictures. Mr. Mayer and I have never been to Branson. We were wanting to get out of town for a few days and thought Branson would be a fun place to go since we hadn't been there. Mr. Mayer found some really nice cabins for us to stay in outside of town. Nana Sue and Papa Jim came along for the fun. Though, they may never do it again! When Diva was a baby Mr. Mayer and I lugged her across one end of the state to another and she never protested. I could mess up her schedule and she never complained. She was a very easy going baby. Then came Shrek and Donkey. Let me tell you...these boys are creatures of habit. I miss one nap and I pay for it severely. So, a vacation out of town sounds like a good idea, right? I thought so. Plans are made. I spend 2 days packing everything. Babies take a lot of stuff! Sheesh! Not to mention a little girl who still wets her pants several times a day on a whim. I never know when she will decide to have that kind of day. It's been pretty frequently lately. I'm at a loss on that topic so if anyone has any advice please share! We sent the 2 pack and plays with Nana and Papa a few weeks prior to the trip. I was anticipating not having any room. I was right. In addition to clothes, we had baby food, diapers, wipes, millions of bibs, toys for babies, toys for big sisters, strollers, yada yada yada. We looked like the Clampets. I'm not sure Branson is ready for us. We went with no particular plans. Mainly because we had no idea what Branson had to offer. The first day we arrive it starts pouring down rain. Well, that's fun. We had no food so we decide to brave the rain and go get some dinner. We head to Branson Landing. A beautiful outdoor shopping area. Rain, not so beautiful. We load the boys into a stroller and the elevator in the parking garage is out of order. Serious?! Mr. Mayer and Papa end up carrying the stroller down the stairs to where the Monsoon is waiting for us. We rush across the walkway and into the closest restaurant we could find and have some dinner. By the time we finish eating the rain has stopped and the sun is coming out. It has dropped about 20 degrees. HOLY COW IT'S COLD! And, we are all in shorts and tank tops/t-shirts. FREEZING! Diva decides she wants some ice cream. Yeah, that will warm me up. I have the ice cream and continue to freeze to death. Pretty sure I put the seat warmer on when I got back in the car. The next day we load our crew into the cars and head to Silver Dollar City. We had to park in the remote parking. Ugh...I decided it would be easier to walk up to the main gate instead of unloading the babies from their stroller to ride the bus. I didn't realize it was up hill the entire way. What a work out. I could barely breathe by the time we made it and my calves were ON FIRE. After I catch my breathe and we all make our way in Diva announces she's hungry, but that she would like to eat junk all day. Fine. Whatever. As long as you're happy about it. We find somewhere to get lunch for all of us--the traveling band of gypsies. It took a good 20 minutes to make our way to a table because everyone kept stopping and asking "Oh, are they twins? How precious." We spend the rest of the day feeding Diva junk and wandering around the zoo they call Silver Dollar City. I was overwhelmed. Diva was just under the height requirement for all the rides. We finally found the little kid rides. Of course the Merry Go Round was out of order. She was able to play in the tree house and ride the swings. That was exciting. After 3 or 4 hours we are all exhausted and ready to leave. Props to Shrek and Donkey. They were great ALL DAY. They even took a little nap in their stroller at one point. I was grateful for that. Mr. Mayer pushed the stroller back downhill to the south 40 where our van was parked. We stopped at the grocery store and bought some steaks to grill for dinner. As Mr. Mayer and I are standing in line waiting our turn our attention is grabbed by a shrill scream. There was a woman and little girl in the line next to us. The little girl looked like she might be 2 or 3 years old. Somehow the shopping cart (empty!) had turned over on top of the little girl. It was a terrifying moment. The little girl was okay. Her mouth was busted a little but otherwise seemed fine. I'm going to assume the woman with her was not her mom since the little girl was screaming and saying "I want my Momma." By the time they left she was calmed down. Day 3....it all goes down hill. Mr. Mayer and Papa had tee times and Nana and I were going to go shopping at the outlet mall. The kids did so well the previous day I was very hopeful that this day would go as well. My hopes were quickly dashed. We had barely arrived when the crying started. It continued all day. I think Nana was worn out and overwhelmed by it all. In addition to the crying Diva had to go potty every 5 minutes. Seriously child. 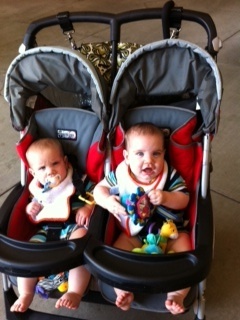 As I am pushing my screaming children through a store a woman approaches me and says "Oh twins!!! You will just love being a Mommy to twins. It's the best thing ever." Really?! Do you not hear them screaming? I am sooooo not feeling the wonderfulness of it all right now. It's been a long day. That was the last store we went to. Nana and I had had enough. We loaded everyone up and went back to the cabin. All three of the kids fell asleep in the car. Diva had asked to go to a restaurant that night for dinner. We obliged. It was really nice and since the kids had napped they were a little tolerable. We went back to Branson Landing and found a restaurant with a patio. As a bonus it was prom night and the girls and their dates were walking by our patio in their pretty dresses. This was a Very.Big.Deal. to a certain Diva I know. However, by the time dinner was over all three kids were imploding. We head back to the cabin and get everyone ready for bed. Diva even asked if she could go to bed. That girl was TIRED. I completely understand the old adage of "I need a vacation to recover from my vacation." It was a fun trip, but a lot of work. This is a tired Momma. These are the only two pictures I took--on the day of our disastrous shopping trip. You can't tell, but they are just catching their breath and resume screaming momentarily. She was obsessed with this ride. 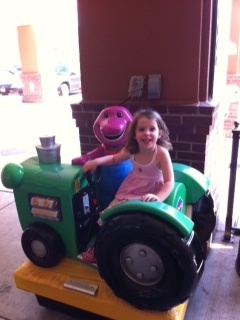 I think she rode it 5 times until Nana and I ran out of quarters.